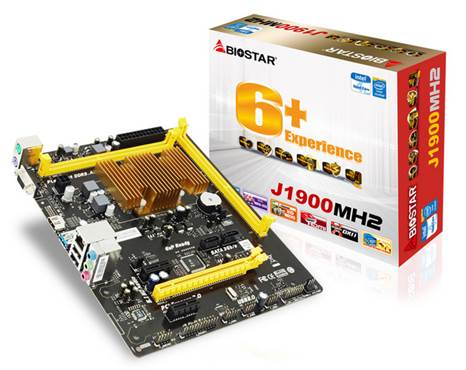 BIOSTAR is offering the J1900MH2 motherboard with the on-board Intel Dual-Core Celeron J1900 processor, using a Micro ATX form factor with a size of 22.6x18.8cm, builders are able to make creative designs for many different uses. The J1900MH2 boards come with the Intel Celeron J1900 Dual-Core processor already installed and it supports two DDR3L 1333/1066MHz memory slots for a maximum of 16GB of memory. With the integrated GPU, watching HD content and playing games is no sweat. Expansion is covered with 1 PCI-E x16 2.0 slot and 2 PCI-E x1 2.0 slots. Indeed, the J1900MH2 board is ready for building all kinds of multimedia systems with its HDMI and analog VGA-out, and high definition audio with the Realtek ALC662 5.1 Channel HD Audio chip. The J1900MH2 also features the Charger Booster function. It is a high powered charging solution for Apple or Android devices such as iPad, iPhone and Android phones and tablets. Charger Booster Technology is able to boost the charging time to be more efficiency and faster once any mobile device is connected to the motherboard. With Charger Booster technology, you are able to charge your devices up to 42 % faster. The J1900MH2 fully meets the requirements for systems running under the Windows 7 and Windows 8 and 8.1. Lastly, the J1900MH2 features ESD (Electrostatic Discharge) protection where the board is protected from accidental electricity charges from user’s touching areas of the board or when devices are connected or disconnected. The MSRP for the J1900MH2 is $65 (around Php2,900).